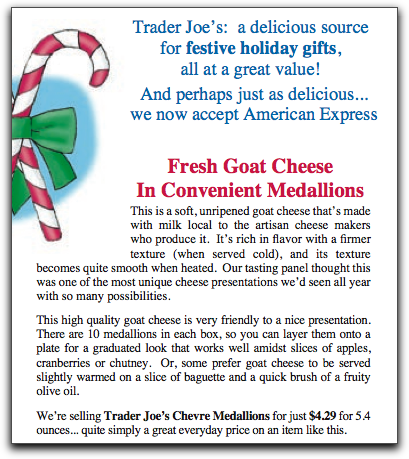 Alien alter ego Sestobal Tweem alerted us to this engaging advertisement from Trader Joe's Fearless Flyer circular. We recommend you read the ad first, just to get the full benefit of the Tweemster's remarks. I note with interest that Trader Joe's is not merely your run of the mill source for festive holiday gifts, but they've gone the extra mile and made themselves "a delicious source for festive holiday gifts..."
Delicious source? Is that their way of saying, "Eat me!"? Then there's the comment about the deliciousness of American Express...which pretty much moves the weirdness meter into the red zone. "Say...this is certainly one of the most unique cheese presentations I've seen all year!" But perhaps the most reassuring discovery of all is the happy news that, "This high quality goat cheese is very friendly to a nice presentation." Cheese: So nice to see you. Cheese: Don't mention it. By the way, I'm cheese...eat me. It almost makes me want to do some "holiday entertaining" this year, just so I can walk up to my guests with a tray of this stuff and say, "Here...have some convenient medallions of goat cheese." If they balk, I can reassure them, "Don't worry...they're friendly!"